This has to be my favorite of the projects and super, super simple. 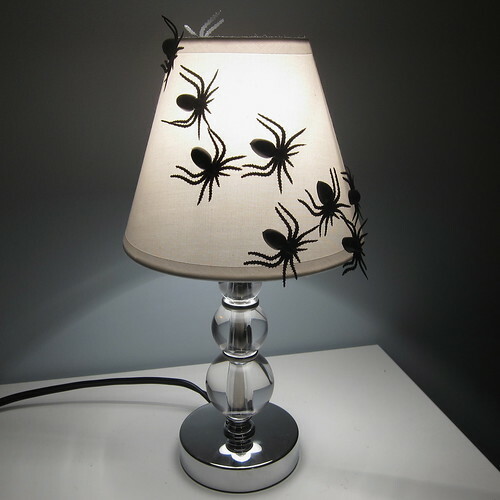 All you need is a lampshade, hot glue and some plastic spiders. I planned to just buy a lampshade, but this little lamp was on sale at Target for $8! It looks great in a bookshelf in my living room. 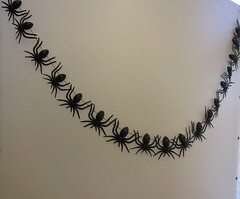 This project not only used some of the plastic spiders I had leftover, but also some of the velvet ribbon I used to hang the spider wreath. 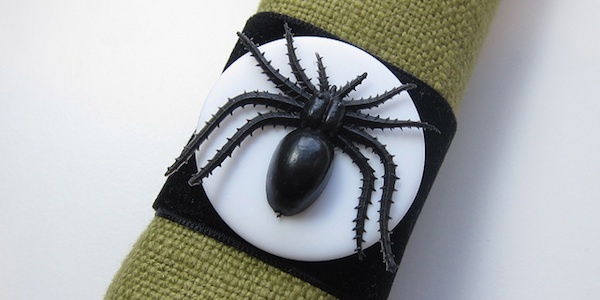 Beyond the ribbon and spider, you need a 1 1/2 inch flat white button and hot glue. I cut enough ribbon to go around a rolled napkin, my napkin was thick so I needed about 6 1/2 inches. I put a little fray stop on the ends of the ribbon, but that is optional. Then I hot glued a spider to the center of each button. The button gets glued to the ribbon at the center. Finally, I glued the ends of the ribbon together to create a ring. You could also sew them together. 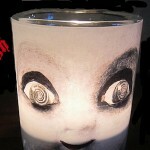 Slip a napkin in and set the Halloween table. 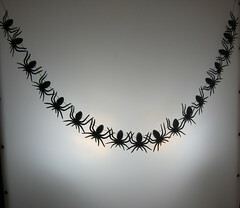 This was the most labor intensive of all the projects because you have to make two holes in each spider. Not hard labor by any means, but a little time consuming. It’s especially effective with light behind it, like in a window. 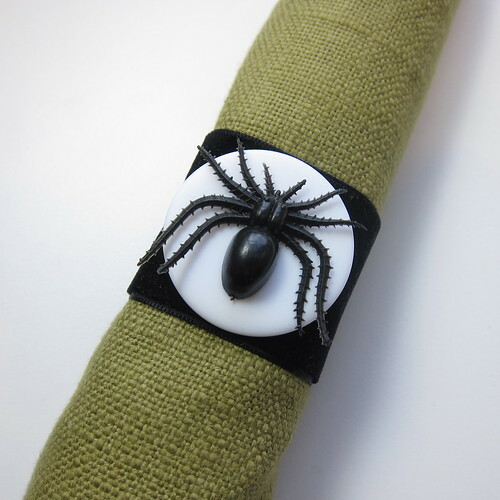 For this project you need spiders, a thin nail, hammer, scrap wood, heavy duty sewing thread in black (I used upholstery thread) and a sewing needle. 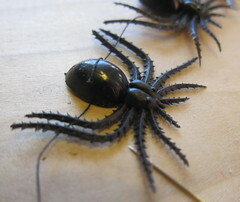 If your plastic spiders are like mine they will have a hollow in the bottom of the spider bottom. 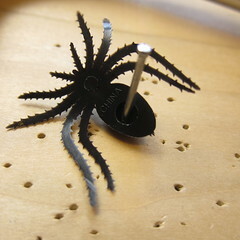 On top of your scrap wood, hammer the nail through the body of the spider on either side at the inside of the hollow. Using the needle thread the spiders on string. Hang. So, what would you do with a bag full of plastic spiders? If you you any of these projects we’d love to see your results in our Flickr group! 8 years ago by Kat in Craft Projects , Crafts , Halloween , Holiday , Projects | You can follow any responses to this entry through the RSS feed. You can leave a response, or trackback from your own site. For the holes, you can also heat up a needle or needle tool and poke holes with the hot needle. 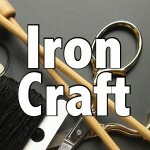 I use an awl or piercing tool (from bookbinding) and one of those fire place butane wands to heat up my needle. Probably a little faster than the hammer and nail–especially since you are dealing with cheap plastic spiders.